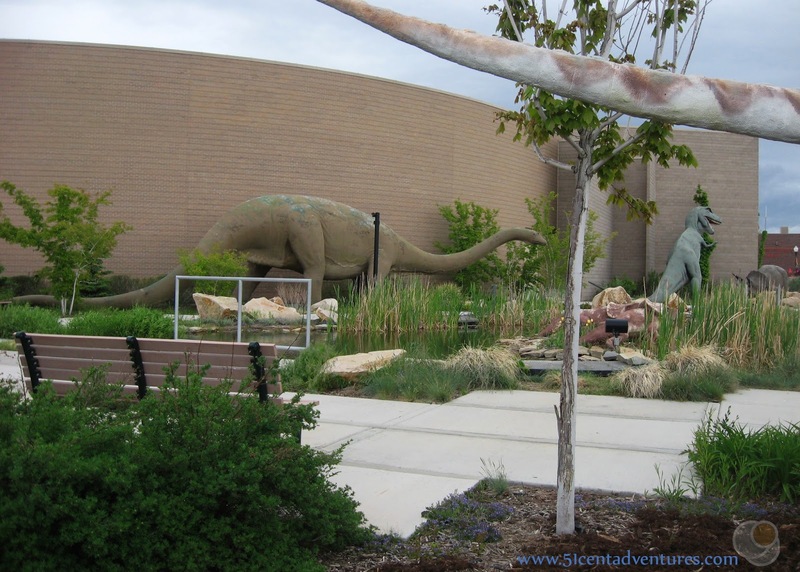 Description: The area around Vernal, Utah is known as Dinosaurland because of the many dinosaur fossils that have been found in the area. The Utah Field House of Natural History State Park Museum is located on Main Street in Vernal. 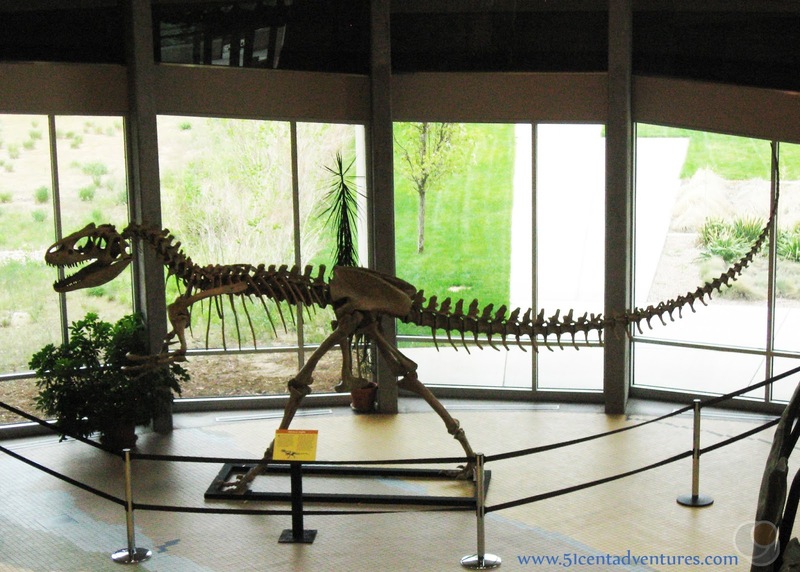 This museum teaches visitors about the many fossils that have been found in the area. 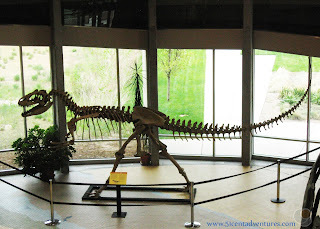 There are dinosaur skeletons on display as well many plant fossils. There is also a short movie that describes paleontology research. Outside the museum there are several large dinosaur statues on display in the Dinosaur Garden. Cost: Admission is $7 per adult, $3.50 for children from six to twelve years old, and free for children five and under. Operating Seasons and Hours: The museum is open from 9:00 am to 5:00 pm every day. However, from October to March the park is closed on Sundays. This was the first stop of the ninth and last day of the Southern Utah Road Trip that my husband and I went on for our third anniversary in May of 2010. 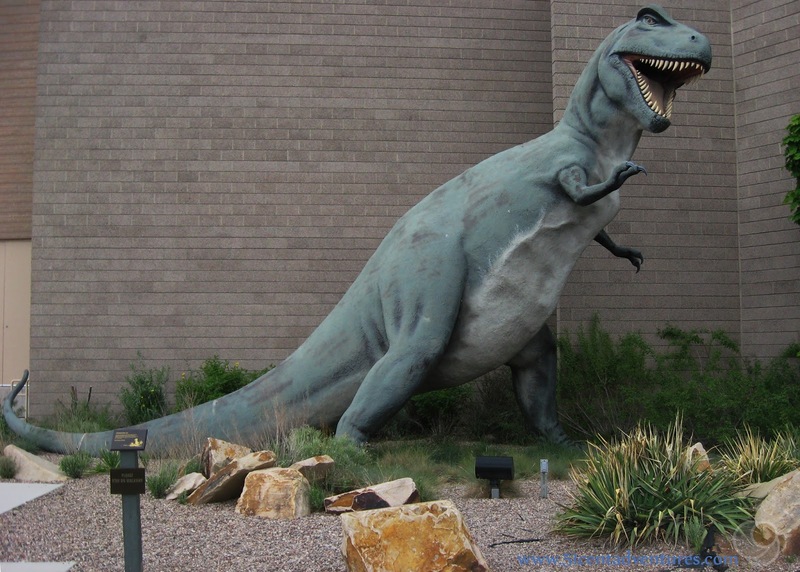 We'd driven to Vernal the day before and visited Dinosaur National Monument. We spent the night in a cabin at the Vernal KOA campground. We were ready to check out the Utah Field House of Natural History before starting our drive home to Logan, Utah. During the previous 8 days of our road trip we'd been looking at the various red rock wonders in Southern Utah. Now as we traveled home through Eastern Utah the theme of what we were seeing changed. Our last three stops were all fossil themed. 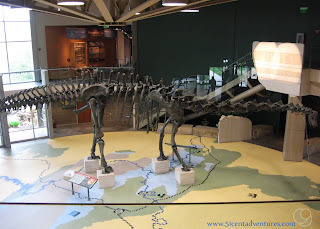 We went to Dinosaur National Monument, Utah Field house of Natural History, and the Fossil Butte National Monument in Wyoming. 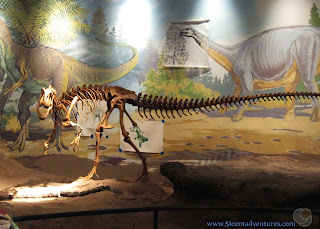 We'd been very disappointed by our visit to Dinosaur National Monument the day before. The visitor center and quarry were closed for extensive renovations, and so we didn't see a single dinosaur bone. There was a small sign at the monument that directed tourists to visit the Field House if they wanted to see dinosaur bones. We were hopeful that we'd have a better time at the the field house. The museum delivered on it's promise of dinosaur bones right from the beginning. There was a large Diplodocus skeleton standing in the lobby. As with most dinosaur bone displays, this statue was made from molds of the real fossils. But these "fake" bones were much better than the none-existent bones from the day before. There was also an other smaller skeleton on display in the lobby. I'm sorry, but I don't remember what kind of dinosaur this was. There were many displays in the museum, but I'm sorry to say, I don't remember most of them. That's not because they weren't interesting. It's because this was at least the 20th stop in the last 9 days and I was getting a little burned out. If this had been the first stop of the trip I'm sure I would have been super excited and interested in everything. I do remember the wall of fossilized plants that was part of the Rocks in Time exhibit. These carefully cut and laid out pieces of rock were visually appealing on their own. 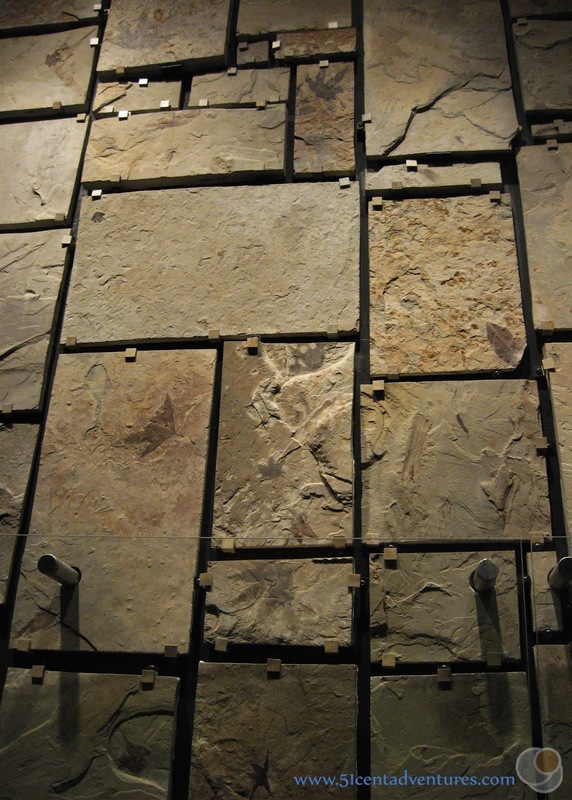 The fact that each rectangle contained a fossilized plant made them even more interesting. I spent a lot of time looking at this exhibit. Outside the museum was a special surprise. There was a "Dinosaur Garden" containing 13 different statues of dinosaurs. My husband had been here before as a child, but he didn't realize that until we went outside and he saw the dinosaur statues. The statues were fun to look at. We didn't have kids at the time, but I know that this would be their favorite part if we went to visit the museum now . If we are ever back in the Vernal Area I want to stop at this museum again. It's one of those places that, even though I don't remember it really well, I do remember liking my visit there. It was definitely worth our time, and the quality of the displays made me glad that we'd decided to travel home this way. 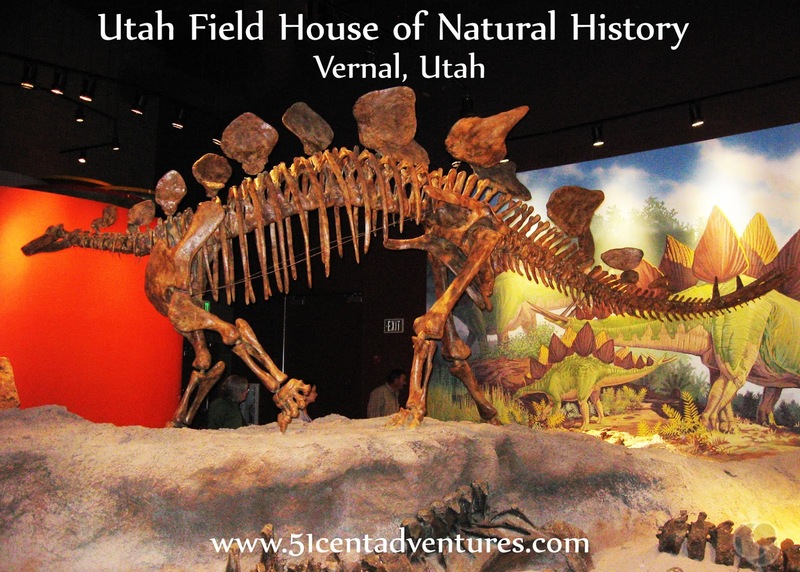 Recommendation: No visit Vernal and Dinosaurland would be complete without a stop at the Utah Field House of Natural History. 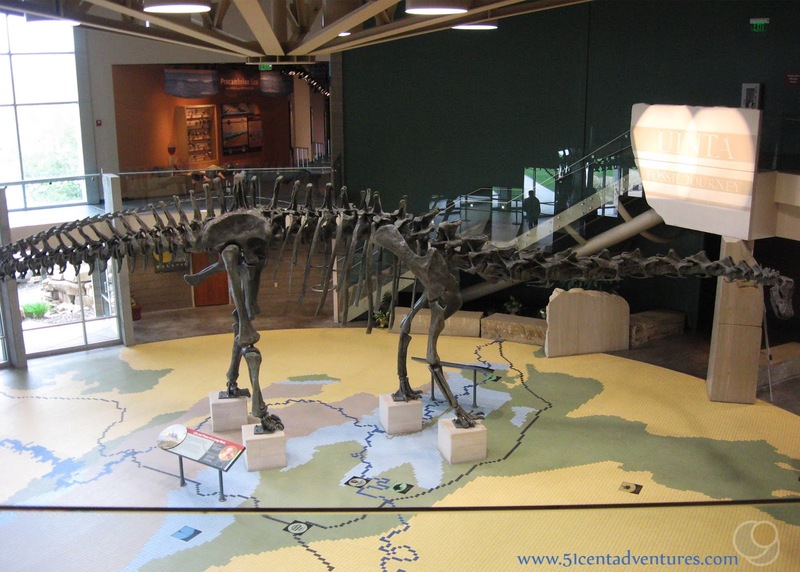 The exhibits inside the museum help you understand how the surrounding area came to be one of the best places in the world to find dinosaur fossils. Directions: The museum is located on main street in Vernal Utah. Additional Information: If you've ever wondered how scientists make a mold of dinosaur bones then you should check out this description of the mold making process from howstuffworks.com. Places Nearby: This completely random, and won't apply most of the year, but it was funny so I'm going to share it anyway. When my husband and I woke up in the morning we were pretty sick of eating our vacation food. So we decided to try to get breakfast at a fast food place. We drove up and down Main Street in Vernal but we didn't see anything we liked. What did catch our eye was a sign advertising a free breakfast at the fire station across the street from the museum. Apparently this breakfast is an annual event that the fire department hosts for the city one day during the month of May. So even though we were obviously tourists we stopped to eat at the community breakfast. It was delicious. Similar Places: If you live along the Wasatch Front and don't want to make the drive to Vernal then I suggest you visit the Eccles Dinosaur Park in Ogden. This place has lifelike statues of dinosaurs as well as some fossils on display.